In an age of USB power standardisation, musical instruments can seem a little out of touch, requiring a veritable smorgasbord of voltages and connectors - that’s where Austrian firm Songbird FX swoops in with its Birdcord USB voltage converter cables. 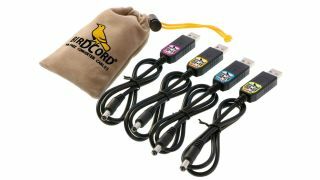 Available in four different formats, the Birdcord converts 5V USB into 6V, 9V, 12V or 18V DC voltage via a circuit hidden in the USB plug. The range of voltages means the Birdcord can be used with any musical device that features a DC jack and a power draw of less than nine watts, which covers a host of effects pedals, synths and micro amps. Songbird FX also points out that Birdcords can be combined with USB power banks, allowing musicians to break free from the tyranny of power outlets. Each Birdcord costs €16.99 (approx $19) direct from Songbird FX.